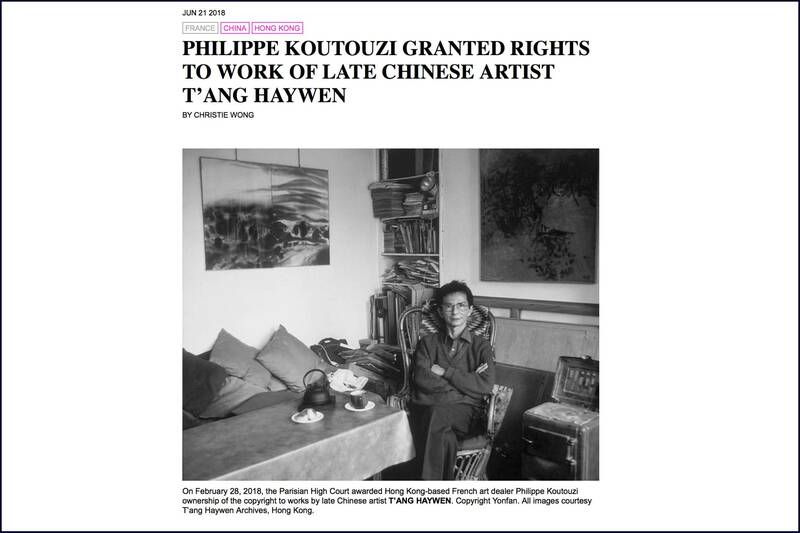 On February 28, the Parisian High Court awarded Hong Kong-based French art dealer Philippe Koutouzi ownership of the copyright to works by late Chinese artist T’ang Haywen, according to a report byThe Art Newspaper dated June 12. The decision concludes a decades-long struggle over ownership of the artist’s estate after he died without an apparent heir in 1991. T’ang spent most of his artistic career in Paris, having moved there in 1948, and his assets were absorbed by the French state when an heir could not be found. Koutouzi, a longstanding proponent of T’ang’s work who is currently penning the artist’s catalogue raisonné, located the artist’s surviving brother in China several years later, successfully transferring T’ang’s estate to his brother in 1995. In the process, the artist’s brother signed a notarial deed ceding copyright to Koutouzi for a symbolic sum of one franc. With the brother now deceased, the settlement was contested by Parisian art dealer Enrico Navarra, who filed a complaint in France accusing Koutouzi of organized fraud in 2011. Navarra alleged that Koutouzi lied about the existence of T’ang’s brother for his own gain. Following a criminal investigation, no evidence was found to support Navarra’s claim, which was reiterated by the High Court when the decision to award Koutouzi copyright ownership was handed down. Koutouzi has been entangled in multiple legal disputes over his claims that dozens of works attributed to T’ang are forgeries. This has become a more pertinent problem as T’ang’s work has risen significantly since the late 1990s in popularity and recognition, with key exhibitions at the Taipei Fine Arts Museum in 1997; the Guimet Museum, Paris, in 2002; Art Basel Hong Kong in 2013; and de Sarthe Gallery, Hong Kong, in 2014. The artist’s auction record reached a new high in 2015 when an untitled abstract painting produced circa 1964–66 sold for HKD 3.4 million (USD 438,590) at Sotheby’s Hong Kong. Koutouzi currently serves as chairman of the Hong Kong-based T’ang Haywen Archives, which works to assemble documentation of the artist’s life and protect his body of work. He told ArtAsiaPacific via email that he will continue tackling forgery through not only judicial means but also an “educational approach,” leveraging his knowledge of the artist’s work, which he shares on the T’ang Haywen Archives website, as well as technical expertise, through studies such as carbon dating. "T’ang Haywen Archives is no longer alone in this fight; several merchants who were abused by counterfeiters... have taken legal action," he added. On his dedication to protecting T’ang’s legacy, Koutouzi remarked: "After seeing some of T’ang’s paintings and learning the details of his life, I understood that he was a painter like no other. He was detached, sincere and generous; light yet powerful; eminently recognizable, with his great diptychs, but little concerned with his fame; an inventor and pioneer of certain contemporary modes of expression. The long and difficult legal journey has now become an element of his biography, demonstrating that even in the eyes of the most wicked people, T’ang is an important artist who cannot be ignored." To read the original version, please click to the website of Art Asia Pacific or here for the PDF version.